News from LMCU: 2015 Hutt Scholarship call for entries is open! 2015 Hutt Scholarship call for entries is open! Two additional scholarships added for 2015! This is the question we’ll ask of high school seniors looking to enter the Lloyd F. Hutt Scholarship essay contest this year. Established in 1991, this program now awards ten $2,000 scholarships to be used toward the future academic goals of its winners. 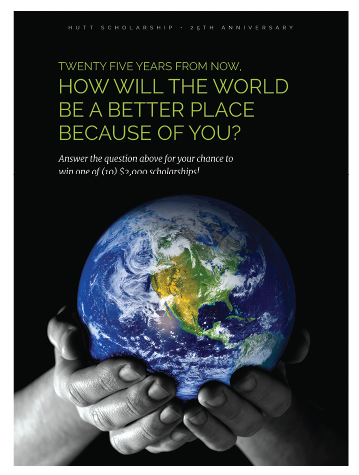 For 2015, entrants are charged with writing a 750-1,500 word essay, answering the provocative question: 25 years from now, how will the world be a better place because of you? Essays will be evaluated by an independent panel of local judges, with greater attention paid to creativity, clarity and originality rather than mechanical or grammatical proficiency. Application deadline is January 31, 2015. Winners will be announced in the May 2015 newsletter. Interested high school seniors must complete an application available online at lmcu.org/hutt, or any LMCU branch location. Questions or concerns can be directed to communityrelations@lmcu.org.